Rosie's Woodland Paradise! Come relax and rejuvenate! Are you looking for a quiet retreat to rejuvenate your spirit with nature surrounding you in the woods? Do you want to escape from the city within minutes? 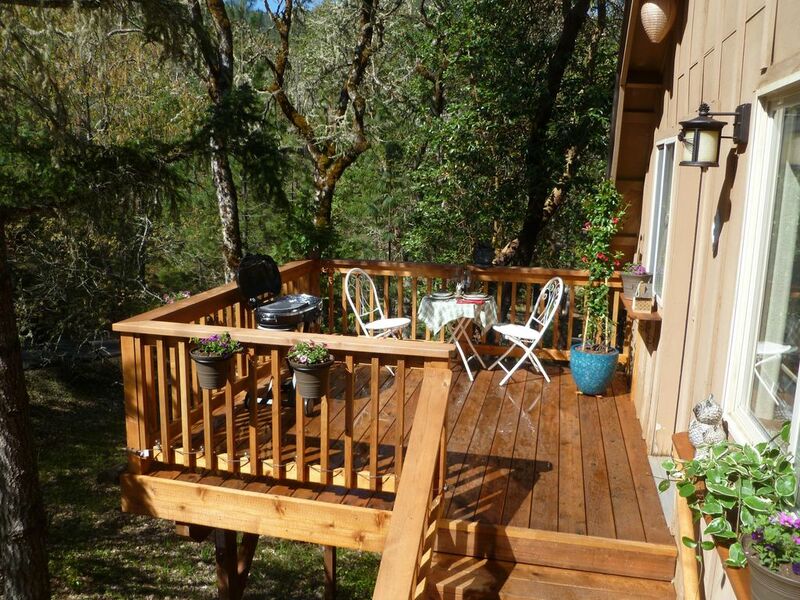 We are located minutes from downtown Rogue River. Come experience the nearby wild Rogue River's recreation area, the fresh woodland smells and wildlife surrounding you! Our cozy mountain hideaway is the perfect spot to come enjoy nature and the mountain views. You may see deer, wild turkeys, fox or other animals coming to the pond for a drink. Or sit by the fire pit listening to frogs and crickets at night while eating smores. There is so much more to enjoy in our area! After a full day, you can come home to the quite mountain retreat to listen to nature sip a drink, relax, and reflect on the day! Property manager lives at separate house on property. I have always been drawn to the countryside and mountains for fun and relaxation. Southern Oregon offers so many activities and places to explore! i would love to share the views and peaceful atmosphere for those needing a place to stay to do the same. Internet is Satellite based. It's good for most things, but may not be as strong as what you are used to at your home or office. This particular Airbnb Is like a slice of heaven carved out of the woods. This place was so cute and clean it also was very warm and inviting. We use Airbnb and Vrbo almost exclusively when we travel and Rose’s place was by far the most accommodating space we’ve been in. It’s not a large space, but for a couple traveling it had more than we needed. The amenities Rose has incorporated to make her place feel like home were so nice and the homemade bread and tortillini soup were just icing on the cake. Private, quiet, beautiful spot to recharge! This delightful cabin and relaxing location had so many unexpected delights... from a fire pit, and a hammock, to goodies galore and a handful of options for meal preparation. The cozy and inviting decor and extras made it so welcoming. We felt extremely pampered by the owner. It is out of town but close enough to enjoy some hiking, dinner in Jacksonville and anything else in the Medford, Grants Pass area. I would highly recommend it and hope to return someday to savor it once again! It is highly recommended to people wants to really get away from work and busy life to the silence and beauty of nature in a cozy, beautiful, extremely clean, very detailed and nicely decorated place in the middle of woods. Rose was very thoughtful of providing us with everything we needed for our stay, even more! Welcoming us with warm soup and homemade bread, some gifts and supporting us with every question we had. We really enjoyed our stay and wants to come back maybe sometime soon! I walked through the door and BING! A timer goes off, the host Rose says " Oh the bread is done." She cooked us homemade bread AND tortellini soup. So that pretty much sums it up, I probably don't need to mention that the house is awesome and has skylights in the roof, that the kitchen had everything you needed for meals, and the fridge was full breakfast foods, but I guess I will :) how awesome is that? Anyway I was blown away, and really regretting that I only booked one night. Don't hesitate this is a great experience! it was a awesome to have a guest from Alaska and a pleasure to provide you both with a place to rest and a hot meal after such a long trip. I hope your adventures in the Redwoods and touring of Oregon countryside was all you thought it would be! Please come again sometime! Best place we have ever stayed.